It’s not a struggle for me. I’m not sure why meal planning comes naturally to me. 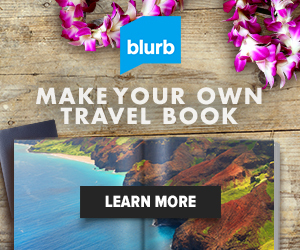 Perhaps it’s my need to compulsively plan things? It’s not like I grew up in a meal-planning-disciplined family. Quite the contrary. It was certainly a struggle we had in my parents house when I was growing up. Me (or dad): I don’t know, what do we have available to make? Mom goes to the grocery store the next day, yet we still never could figure out what to make for dinner in the subsequent days. And most of the time, we’d end up going out or ordering out. 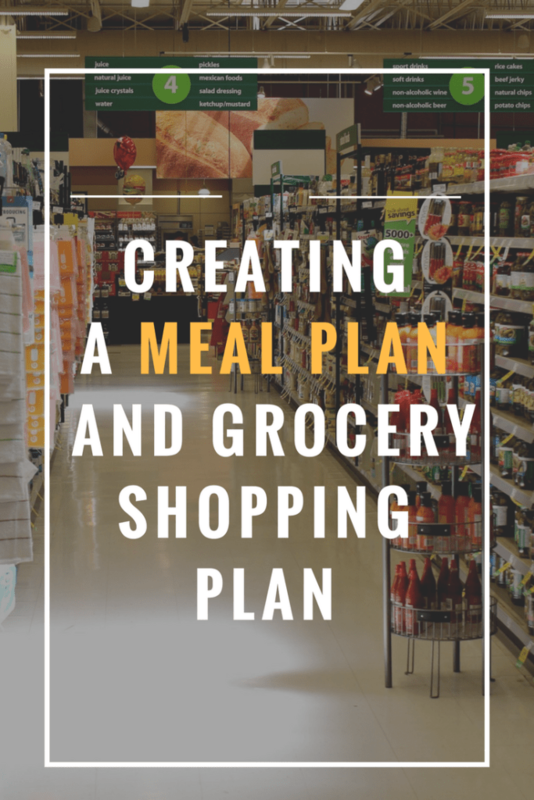 Ever since I have been living on my own after college, and even now that I’m married, I have always planned out my meals, went shopping at the grocery store to buy the ingredients I needed for the meals, and ate my meals I planned out. Sure, there are occasional disruptions, like going out with friends for dinner one night instead of making my meal. Or perhaps I was at a work conference that offered a huge lunch and I was only hungry for a smaller, lighter dinner. So to be honest, I really don’t understand why more people don’t do this. I don’t understand how people eat or grocery shop without a meal plan. But, since it seems to be a struggle for most folks I know, I thought I would offer up my tips. My meal planning routine has evolved over the past eight years from my life as a single professional living on my own and surviving on an entry level salary in a very expensive area, to the current stage of my life as a married, full-time professional woman. So I’ll offer my current meal planning workflow, and then in future posts, discuss some of my previous workflows, since they might still be valuable to other folks. 1. 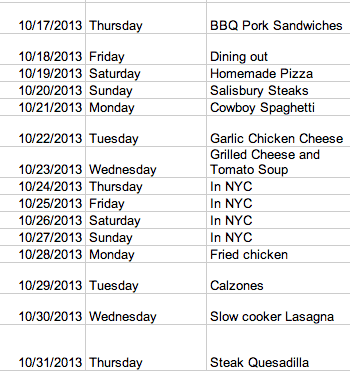 On the first Friday of every month, I open up my “Monthly Meal Planning” spreadsheet in Google Docs. 2. I enter dinner recipes for each day through the first Friday of the next month (so basically four or five weeks worth of meals). I exclude days that I know we won’t eat dinner at home, like if we have a family party to attend, or if we’ll be out of town. I usually pull recipes from Paprika, the recipe manager program that I use to save all the recipes I find online or in magazines. For the monthly meal plan, I try to mix in some of our favorites, along with at least one or two new recipes to try that month. I’ll talk more about how I find and manage recipes in a future post. 3. I review the recipes that I entered for the month to check for various things. For instance, did I add Mexican food recipes two days in a row? Or, since I have two recipes that call for a half of a container of Ricotta Cheese, maybe I should make those recipes one week apart instead of three weeks apart, that way I can use the same Ricotta cheese container. 4. After the meal plan looks pretty good, I review the ingredients required for each of those recipes for the first week (I only shop for groceries one week at a time). It does not matter if I have made that recipe 50 times before, I always check the ingredients! If I need to buy the ingredients from the supermarket, I add it to the grocery shopping app that I use, called Grocery IQ. If I’m not sure if I need to buy the ingredient, I check out our pantry or fridge to see if we have it. I repeat this ingredient review step each subsequent week that I go grocery shopping. 5. Armed with my shopping list, I check my coupon organizer to see what coupons, if any, I have for items on my shopping list. 6. I go to the grocery store on Wednesdays to shop for our weekly groceries! In addition to what is on my shopping list, I also have a pre-populated list of food staples that we buy every week, or just about every week, like milk, bananas, lunch meat, etc. 7. I get home, Ken helps me unload and put away the groceries, and we’re all stocked to cook our meals for the next seven days! 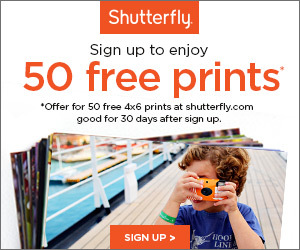 Is this the system I’ve always used? Nope, but it’s mostly been close variations of this. (For instance, when I was single, I used to make fewer meals each week and then just eat leftovers for several days). Is it perfect? Nope. I would like to get better at stockpiling items we like when they are on sale. For instance, I only buy the cereals we like when we’re running low. Same thing for things like butter and salad dressings and soda. Because of this, I’m not always getting the best price. Believe me, when we’re down to two cans of soda and I have to pay $5.29 for a single twelve pack during my weekly grocery shopping trip, it pains me. But at the same time, while it may cost us more money, this system saves me a lot of time because I don’t have to stalk the weekly ads. I would like to get in the habit of doing that though in order to cut back on our grocery bill. I would like to get better adding some light lunches and special weekend breakfasts to my monthly meal plan. I feel like we struggle a lot with what to eat for weekend lunches, and since I work from home two days a week nowadays, I really need to work on planning my lunches better. With regards to other lunches at work, many times I bring leftovers from the night before, especially if it’s a pasta or beef-based meal. If it’s chicken, I don’t bother. I hate microwaved chicken leftovers. Other than that, I’ll usually buy lunch. I’ve given up on feeling guilty about this. A lot of times it’s just easier. Most mornings I just eat cereal or get an egg sandwich made at the grill at my company’s cafeteria. In general, I really like to cook. But there are some occasional days when, despite having the ingredients on hand and knowing what meal to make, I just don’t feel like cooking. If I got home late from work, or had some unexpected evening errands to run, I might not feel like cooking when I get home. So, we usually try to have some basic frozen items on hand, like frozen pizzas, fish sticks, chicken nuggets, hot dogs, etc. To avoid eating these more processed foods, I would like to experiment with some freezer cooking recipes, that way we can eat a home cooked meal that’s already been prepared. But one issue with most freezer meals I’ve found is that they have to be left in the refrigerator overnight to thaw before they’re ready to be cooked. Since the nights I don’t feel like cooking are generally last minute and unexpected, I don’t know if freezer meals would work for that purpose. So, there you have it. Seems simple enough, right?